Last night, as the sun set over Lake Tahoe, I drove north on Highway 89 and headed west, past the once-Olympic venue and ski area Squaw Valley to a place I remember reading about as a kid in school, a place where hell basically surfaced on earth in the early winter of 1846: Donner Lake. We all know the story, one of the most infamous tales of American pioneer journeys gone wrong. And I can tell you firsthand that there is something magically eerie about the place today, something that hit me when I took the exit for Donner Pass from the Interstate. At times, it’s dead quiet, the sun or the moon beaming off the snow-covered peaks that stand tall around the lake. Donner Lake near Tahoe. Photo by Wake and Wander. Other times, and more typically, the wind howls, blowing through at speeds near 60 miles per hour. When I got out of my car to take the photo above this afternoon, I had to immediately pull down my sunglasses to protect my eyes, and I could barely hold the camera still. Getting back in the car 20 seconds later, my hands were stinging and I had salty water streaming down my face. As you can see in the photo, this was a bright, blue, sunny day. No snow, no clouds, no rain. Even at its best, the worst can be sensed. 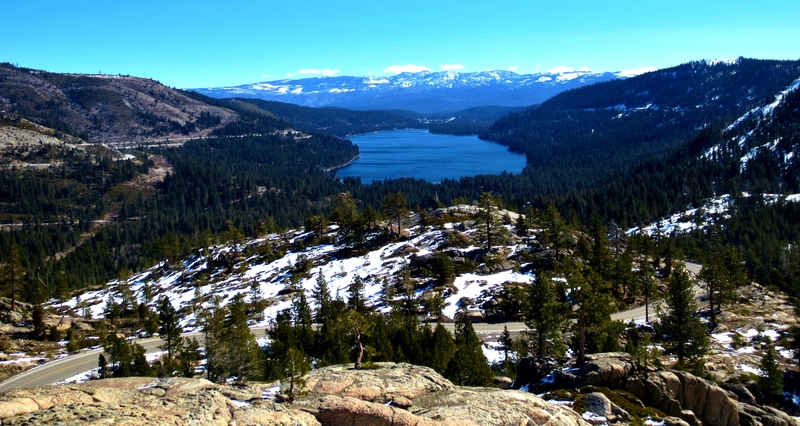 I felt firsthand the power of the wilderness that derailed the Donner Party, forcing them to result to cannibalism, no doubt blinding them to the beauty that masks this deadly terrain. Tonight, I’m bunking up in a lodge nearby, and the creepiness that haunts me is what brings about a new-found respect for a legend that lives on almost 150 years later. You will, for sure, be hearing more from me on this.